New research breaks down peak human functioning into ten traits. This quiz will tell you if you have them. Sitting atop this pyramid is self-actualization. This, in essence, is the peak of human flourishing. In this state our top priority is simply becoming the best version of ourselves we can be in order to make the world a better place. It's what we're all aiming for, basically. So have you gotten there yet? It seems like a pretty heavy question and not an easy one to answer, but psychology has been hard at work on the problem. Using surveys and correlations with other proven measures of flourishing and success, researchers recently had a breakthrough. They were able to break down the big, hairy goal of self-actualization into ten more manageable traits. They even came up with a simple quiz to measure them. Self-actualization is awesome. Are you getting there? Kaufman's work also confirmed that reaching this vaunted state is a really, really good thing. 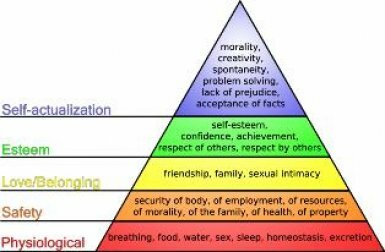 "Self-actualization scores were associated with multiple indicators of well-being, including greater life satisfaction, curiosity, self-acceptance, positive relationships, environmental mastery, personal growth, autonomy, and purpose in life," he reports. It was also negatively correlated with destructive and unpleasant characteristics like impulsivity and destructive brooding. It will even help you get ahead at work. "Self-actualization predicted greater work satisfaction and work performance, as well as greater reports of talent, skill, and creative ability across a wide range of fields from the arts and sciences to business and sports," Kaufman adds. We now know more completely what self-actualization is actually made up of, and we're also quite sure it's a wonderful thing to aim for. So how do you actually get there? Kaufman can help with that too. He's developed a simple, online quiz that can score you on each of the ten dimensions above in just minutes, suggesting strengths you can lean into and weaknesses you might want to invest in.